Rhetorical question of the day: Have you ever run across something so unusual and new that it captivates your interest for longer than anything you can remember in the most recent past? (Let’s leave that mysterious new stain on the living room rug out of the equation.) It seems that app developers, in a bid to draw in young players, try to out-quirk each other; leaving consumers so jaded that nothing seems to have any shock value anymore. In a world of attempted idiosyncrasies, Moomin and the Lost Belongings is an app of distinction. One in a series of interactive storybooks, this particular gem is a shining example of how to make children pay attention, learn, and have fun while doing so. Illustrations are simple yet unconventional, and the characters’ names leave plenty to the imagination – ask your preschooler to explain the moniker “Little My”. Moomin is… Well, we’re not quite sure what he is, beyond looking like a cross between a cow and a hippo. 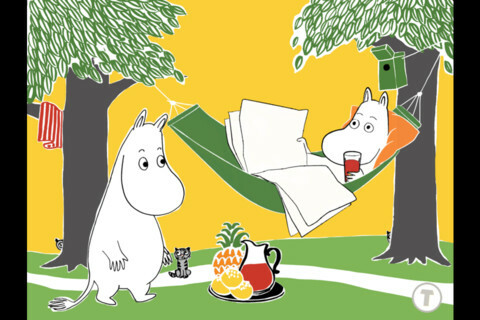 Anyways, he’s on a walk through his hometown of Moominvalley and his absentminded pals need his help to find their – wait for it – lost belongings. Players tap, swipe, and tilt the screen to help reveal misplaced possessions, all the while reading along to a soothing British narration of the story. Watching my 2-year-old play this app was a joy. She easily navigated the pages of the story and enjoyed searching for the lost belongings, which aren’t deeply hidden but also not immediately obvious. As a parent I appreciated the simplicity of the illustrations, finding it refreshing to take a break from the bouncy, brightly-hued apps that we have been playing as of late. 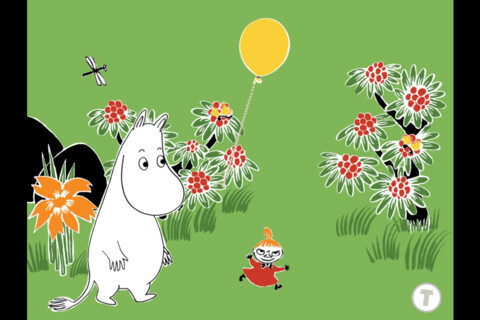 The Moomin series, and in particular this installment, is a fresh new take on the digital storybook. From the original illustrations to the unconventional cast of characters, Moomin may soon become a regular in your house. Priced lower than the average e-book at $1.99, it’s well worth a download. 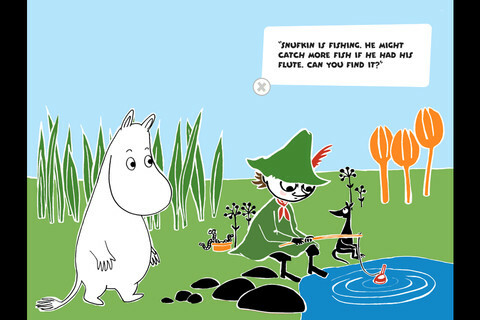 Moomin and his unique friends need your help finding their misplaced belongings.